Synopsis: Maya (Chastain) is a fresh agent in the CIA assigned to the task force in Pakistan charged with finding Osama bin Laden. Through various means and over many years, Maya must find and cultivate leads, all while fighting her higher ups, world politics and the loss of co-workers to the war on terror. Andrew: Hello readers! Sarah and I visited New York City for Christmas Eve, and while we were there we took the opportunity to find a showing of Kathryn Bigelow’s latest film – Zero Dark Thirty, an in-depth look at the ten year manhunt for Osama bin Laden following the attacks on September 11, 2011. It’s Bigelow’s first directorial effort since 2008’s The Hurt Locker, which won the Best Picture Oscar and earned Bigelow the Oscar for Best Director, a first for a female director. Sarah: Can I say, first, that this movie has an absolutely huge cast? A: Heck yes it does, led by Jessica Chastain (Lawless) as a CIA operative named Maya, as well as Chastain’s Lawless co-star Jason Clarke, Kyle Chandler (Super 8), Jennifer Ehle (The King’s Speech), Mark Strong (John Carter) James Gandolfini (Killing Them Softly), Joel Edgerton (Warrior) and Chris Pratt (Moneyball). This is one we’ve been looking forward to for some time now. The subject matter is obviously pretty interesting and I was personally curious to see how Bigelow’s follow-up to The Hurt Locker would be. So now that we’ve seen Zero Dark Thirty, what did you think of it, Sarah? whose specialty is getting information out of their detainees. S: I liked it! The trailers led me to believe it would be epic; not necessarily super action-packed, but that it would at least be big and tense, and it was. But I enjoyed it! I thought it was good. I thought the cast did an amazing job. It was definitely something different, as it was something I hadn’t seen Chastain do before and she knocked it out of the park. A: What about it in particular did you like besides the cast? S: The tension building, for one thing. Bigelow did a good job with that. So while it’s a long movie, there are parts that really get your blood pumping, much like it did with The Hurt Locker. What did you think of the movie? S: You mean the detainee program that Obama eventually shut down? A: Well that, but I also mean just how they got info by straight up lying to the detainees…bluffing, if you will, and then what was pure luck and what was just going off of hunches. Because they apparently didn’t have a whole lot of concrete stuff to go off of, so they had to go off of supposition and just kind of going with Maya’s gut and what they DID have, as little as it was. So I was fascinated to see that they really didn’t have a whole lot of evidence before going into bin Laden’s complex. But to your point, I totally agree that it has its tense moments, but we’ll get to that in a bit. S: Yeah, I think the audience is going to have to marinate over this movie, because it’s pretty heavy. It’s opens with extremely heart-wrenching sounds of phone call recordings and, I think, black box recordings of people on the planes and in the Twin Towers. That really got to me, it was incredibly upsetting, and it’s really meant to put you in that mind frame and get you ready for the search for the guy who did it. A: That those were the CIA failures because they hadn’t yet caught bin Laden or were maybe focusing too much on bin Laden and not enough on the homeland. S: Right. So that was really interesting. I’m a little more intrigued by the fact that the CIA is now forcefully denying things that occur in the movie. What were they saying exactly? A: Oh, how the CIA’s director has come out recently and said the film takes artistic license while portraying itself as historical accurate. Something to those effects. S: Yeah, so I find it interesting that the government is now backtracking on things they helped the filmmakers with, so…very interesting and whether or not much of it is true or not, it makes for an interesting movie. But I have to say this: there are far too many characters. And it’s not just that, like, they’re bit characters or bit parts, I understand that. It was a huge operation. But there are huge names in this movie that I have no idea who their character’s names were, and I’m not sure you need to know, like Gandolfini. I have no idea what his character’s name was. I have no idea who Mark Strong’s character is. A: Yeah, there are a lot of characters, but you’re right – it was a very extensive, ten-year-long mission with a lot of players in it. I know Gandolfini played the former director of the CIA [Editor’s note: Gandolfini played Leon Panetta], but you’re right, I don’t remember who Mark Strong played [Editor’s note: Strong’s character is simply named George, but he’s some sort of higher up]…I mean, they do say his name, but I don’t remember his, or Joel Edgerton or Chris Pratt’s names, because so much happens so fast that their names almost aren’t that important. All I know is Edgerton and Pratt were members of SEAL Team Six. S: The only characters that I can remember their names are Jessica Chastain’s Maya, Jason Clarke’s Dan and their immediate supervisor in Pakistan, Joseph (Chandler). But that was a negative for me; that there were so many characters that I can’t remember all the main players. A: Sometimes the movie was a little tough to follow BECAUSE there are so many players. I also thought that it had some pacing problems. It’s two and a half hours long, and I felt like it probably could’ve been cut down by about twenty minutes because they linger on a lot of things. A: So, I mean I felt like some of that could’ve been clipped down a bit. I also felt like the actual raid on bin Laden’s complex was a little long. It dragged at points. Because you get jazzed for it to finally happen, it comes, and then it takes forever for it to all unfold and the movie just loses some steam. So I felt it had some pacing problems. I need to knock it down a little because of it, because I personally lost some steam towards the end and got a little bored with it at the end. Which is something that did not happen with Argo or Looper. Osama bin Laden, but we found that the raid took way too long. We almost lost interest by the end. S: Well halfway though that scene is when I remembered that particular story from the news. I had completely forgotten about it. A: I had no idea what was going to happen, so I thought the way Bigelow ratcheted up the tension in that scene was phenomenal. S: I did remember halfway through, but even so I thought it was incredibly tense. A: Yeah, so that scene was fantastic. Great tension building. But the finale…we pretty much know what the final product is, but I felt almost no tension whatsoever. Unlike in Argo, where you know how it essentially ends, but it’s incredibly tense the whole climax. So I felt like this movie fell a little bit short there. But it is a fantastic character study and I thought Chastain does a phenomenal job. S: Yeah, I did, too. A: Mark Strong does a great job, really all the supporting actors do a good job with what they’re supposed to do. 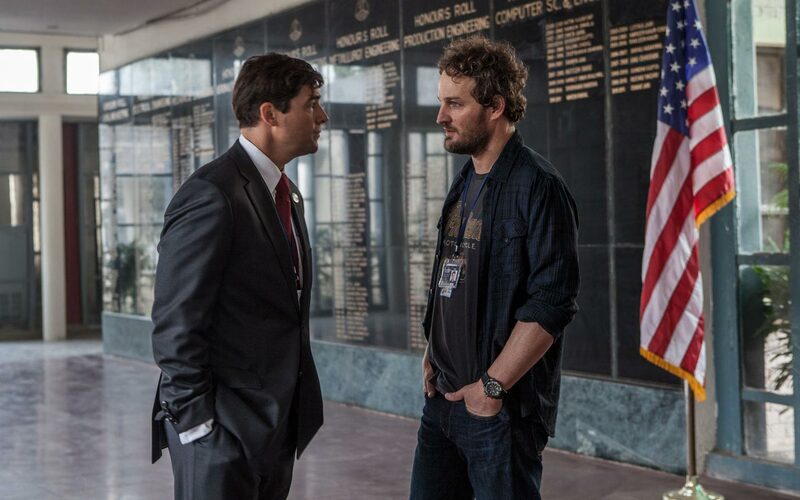 I really liked Jason Clarke’s Dan and I kind of wish he had been in it more, but he kind of drops out after the first third. S: Dan was an interesting character, because he showed that he was sent there FOR that job. He was sent there TO interrogate detainees. And once Obama shut down that program he was really no longer needed. And it made me wonder what would happen to a guy who had gone through all that. A: Honestly, I thought the movie lost steam as soon as that part of the movie came up, where the detainee program was abolished. Because then it becomes more about the political side and how they have to finagle their way through. S: It does get a little too political and dry, but it still has some great parts in the second half. A: There are some fine points like when Gandolfini and Mark Strong come in. A: Yup, and by that you mean Mark Duplass (Safety Not Guaranteed), who plays a CIA analyst. Regardless, once it becomes more about what happens in Washington, D.C., the film lost its momentum I thought. Okay, here are some finer points I wanted to touch on: one is about the torture. Leading up to this movie coming, when critics were able to see it first, a lot of the talk had been about whether or not the film glorified torture, stuff like that. Did you get a feel for that at all, or what did you think of that? S: I think Bigelow showed it the way it was. Like, I think that you’re a fool if Americans didn’t torture detainees to get information on al Queda. And…I don’t think she glorified it at all, much like I don’t think she glorified any other aspect of the War of Terror in The Hurt Locker. She showed it the way that it is. I think Americans have a very romanticized notion of what it’s like over in the Middle East, and I thought she brought to light the fact that it’s extremely brutal instead. Yeah, I didn’t get the glorification at all. It didn’t bother me maybe as much as it should have? Call me heartless, I guess. The actual beginning with the 9/11 voices, that bothered me more. A: Why did that bother you? A: Did you feel that was a bit of a cheap emotional ploy then? A: See, I didn’t mind that because I liked how she didn’t show footage from that day, or reenact it. S: Okay, yeah. That would’ve been the cheap ploy. A: I think the decision to play those sounds over a black screen was a simple yet effective take on 9/11. A: Yes, but it’s how the movie starts, and you gotta have 9/11 in there somewhere. I like that she did it this way. With the torture scenes I completely agree with you. I don’t think she’s glorifying it, I don’t think she’s condemning it, I think she’s showing it as it was. S: I bet it was actually tamer than what we really did to detainees over there. A: I’m sure it was. I absolutely think so. Ok, so my second thing is I want to talk awards real quick. Chastain – she’s a front-runner for Best Actress. S: I actually think her character is a lot like Ryan Gosling’s character in Drive, if that makes any sense. S: She really doesn’t have a ton of dialogue. A: That’s not totally accurate. S: Ok, she does towards the end of the movie, but for most of the first half she doesn’t. She barely says anything in the beginning. She’s more of a presence, and her deterioration…where you start to question her about whether she’s just obsessed towards the end…is more about her physically and not so much through her lines. A: Okay. But I still think, like, the scene where she demands for resources from Joseph so she can better track bin Laden? That was her big scene to explode and she had plenty of dialogue in it. That will definitely be on Chastain’s Oscar submission. S: I wouldn’t be surprised if that’s the scene they play during award shows. Jessica Chastain headlines a large cast and does a fantastic job portraying Maya's transformation a green rookie to a borderline obsessed CIA agent. Any awards she wins will be well worth it. A: I also liked the scene where the CIA director goes around a table of higher-ups asking what they think, in percentages, the chances are bin Laden is in the complex, and her response is perfect. When she finally starts stamping her foot down, I really liked that. I think she portrays a good transformation, because you’re right – at the beginning she’s sort of a fly on the wall. S: And we learn later on in the movie that she’s supposed to be like straight out of high school at the beginning of the film. A: True. So I think her portrayal of a green agent into her reaction to getting bin Laden is aces. Her whole character arc is great. I still kind of give the Oscar nod towards Jennifer Lawrence for Silver Linings Playbook, but I can see why Chastain is getting the love she is. A: What do you think of its chances for Best Picture? S: I think it’ll certainly get nominated. I think because The Hurt Locker won…in a lot of ways this isn’t too different, so it’s not something new. The Hurt Locker was something different and new, like The Artist was something relatively different and new…Zero Dark Thirty isn’t like that, so I think that may hurt its chances at Best Picture. A: So you think that’s important? S: I think it’s pretty important. A: So you think it’ll get a little bit of backlash. S: I do, yes, because it’s like, “Oh, Bigelow’s doing another war movie. Alright.” Like, we’re seeing the same thing out of this director. My money is still on Argo for Best Picture. 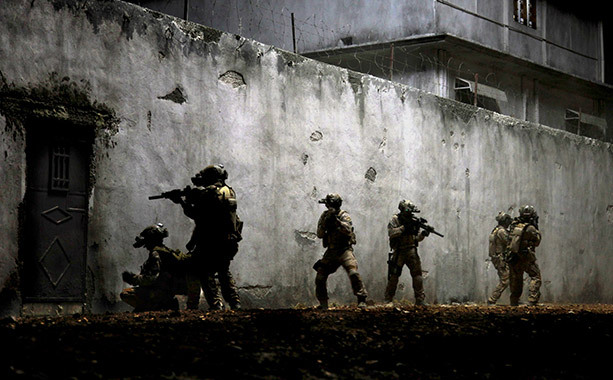 A: Okay, so final thoughts on Zero Dark Thirty? S: I was impressed with Chastain’s performance and I liked the movie as a whole. Will it be one we own? Probably someday. I liked it, but didn’t love it, and I think it is one you need to see in theatres. A: Definitely one you need to see in theatres. It’s a really good movie, and it’s probably the best way the general American public is going to get an idea of how this operation went down, even if the CIA is refuting things now. Strong performances all around, strong direction by Bigelow, and if you’re into the awards stuff this will definitely be a front-runner. FINAL VERDICT: A must-see in theatre! I agree with you guys on this one, your verdict pretty much matches mine. I just finished watching it, and I'm just finishing up my own review. It is incredibly realistic, and I watched National Geographic's "Seal Team Six: The Raid on Osama Bin Laden", which...got facts wrong after you study up, that's a no-no for the National Geographic Channel. Anyways, I did think it was great. I though that people will get lost throughout the middle parts, they are all important, but I'm telling you people will start to get confused within all of the mumbo jumbo, maybe if it wasn't so long. I don't know. Great review, guys. I definitely shed a fear tears from the beginning too, those calls were incredible sad to hear, but I really enjoyed the movie overall! A Six Pack Of... Our Favorite Christmas Movies!